Security and safety of the books of the Living Library (for instance in Egypt); should be books that may be in danger or illegal be chosen for the Library? Online Living Libraries? Make sense? Organization of events in public places/spaces; permissions? Then the work continued in working groups same as at the first day – by countries and organizations. 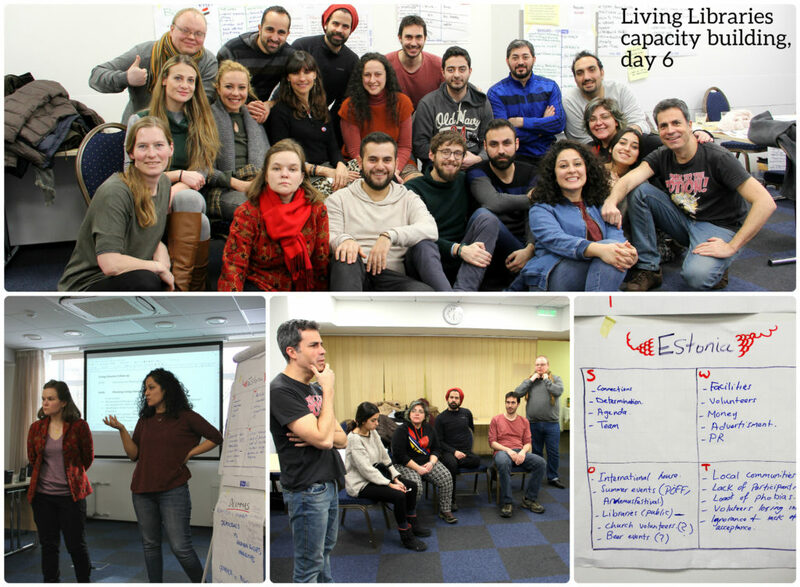 First of all we revised the work started in the beginning of the course – to analyze the local contexts in terms of the needs of community to address by the Living Library, but as well the recourse and positive and negative aspects existing in order to organize the Living Library. This was done through the SWOT analysis and then we did the presentations of the results of the reflection on the strengths, weaknesses, opportunities and threats for our Living Library local events. After that and before going to lunch, the recommendation-groups went back together and finalized their work started before. Now everyone can see the results – the recommendation for readers, organizers, books and librarians of the Living Libraries. In the afternoon (after the very energetic energizer at the snow!) we started looking at what will happen after the training. 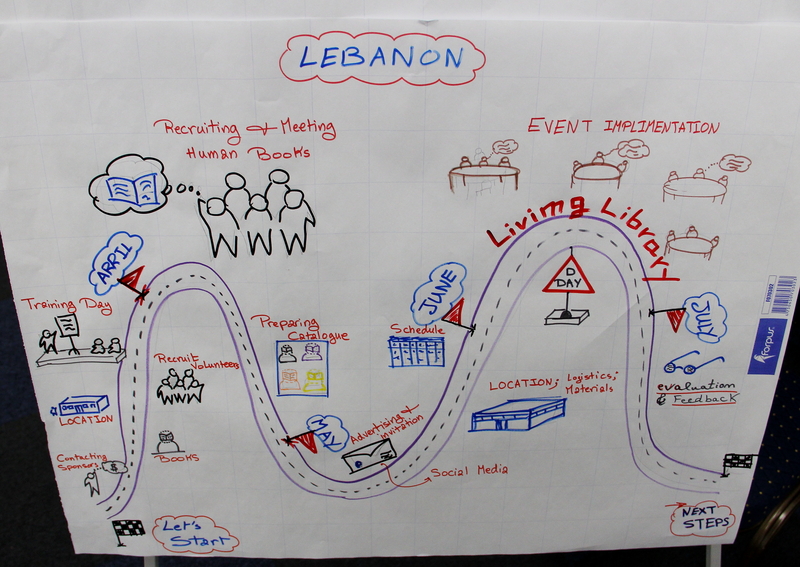 According to the milestones and events of the entire Project we took a look at the time-line: what will happen when and how step-by-step the local Living Libraries are to happen in the partner-countries. The majority of the Living Library events would take place in spring and beginning of summer, as it was planned. The groups could clarify that depending on the local specificity and other events of the Organizations. Then groups continued working on their concepts of the Living Libraries and planning the action-plan in terms of time: how, when, where, with who, with what support etc. they will organize their local events. At the same time summarizing as well the list of the Books, they would like to see at their Library catalogues. The results we re presented to the entire group and they were inspiring and impressive in some way. The work finished by taking a group picture. Then the technical moments and reimbursement was completed, before the group started moving to the last dinner out together. 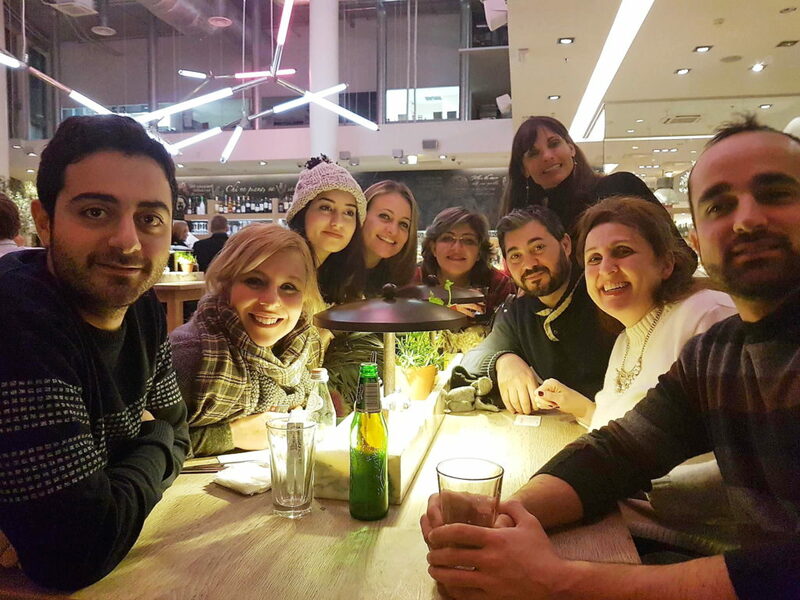 After different dinner, with pasta and pizza, we finally closed the Training course with closing words from everyone, laughing mainly with some sad moments too. Spotting the challenges and SWOT analysis was interesting and useful. We planned the “time-lining” for Living Libraries. How to address the challenges and evaluate the project with the SWOT analysis; needs analysis etc. Mapping Living Library back in my reality. We put the schedule of the planned Living Library in our countries. It was useful to do the posters with challenges and SWOT. Hot to adapt the Living Library concept to our own local circumstances. To plan Living Library event and compare the other’s planning for the mutual enrichment of each other with ideas. Setting the action plan for Living Library (with all the phases). SWOT. Knowing the challenges within our communities. Getting to know the follow-up activities of Living Libraries around the World. 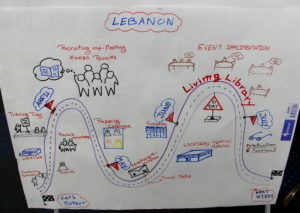 Designing and preparation for Living Library activities in each context. We have translated the models learnt into our local realities. We went deeper into stereotypes in our context. I reflected a lot about my community and how I will implement Living Library the best way. The importance of group dynamics in breaking the barriers among the group. Further our knowledge about Living Libraries.